In 2015 Mary McKie felt she was ready for her next agility dog. Her old dog Todd was 12 and had just retired to Anysize/Veterans, and her competing dog Breeze was soon to be six. Breeze had been a nightmare as a puppy so, in her wisdom, she decided that she would look for rescue – maybe six months to a year old. 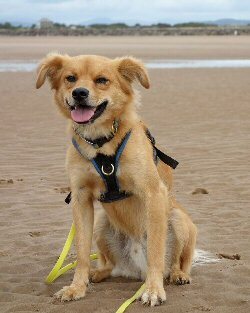 As she lives in South West Scotland, she ruled out dogs from the 'South' as too far away, so how did she end up with a wee dog from Croatia? Having spent many months trawling the internet, I still hadn't seen 'the dog' I wanted. Along the way, I joined a Facebook group called Action Aid for Animals, Croatia – don’t ask me why. If four hours south was too far, there was no way I was getting a dog from abroad! Little by little I was sucked in until, before I knew it, I was making a trip all the way down the M6 to Stafford services to pick up a dog that I had never met and knew very little about. After a long wait at the services - they were delayed- I finally met little Tony. He was absolutely terrified, even refusing the sausage I had brought with me. After a very long journey from Croatia, he was then bundled into my car to make the three hour journey home. What must he have been thinking, poor mite. I had taken a week off work to help Tony adjust to his new home and that he did that fairly quickly. My other dogs weren't too impressed, but eventually they came round. As he settled in, Tony - now having been renamed Chip - began to show more of his character – and what a character he is! He had me in stitches most of the time. His favourite thing was stealing shoes and socks. If one went missing, I would inevitably find it out in the garden. Unfortunately, as the months went on I also discovered that he has an incredibly high prey drive. I couldn't let him off the lead anywhere as he would chase anything that moved, and a few months after he moved in, he very sadly killed a hedgehog in the garden. I now have to be on hedgehog watch. Despite getting severely spined (is that even a word?) and bleeding profusely from the mouth, he just doesn’t give up. Actually, more recently he killed a rat, getting himself bitten in the process. The other major problem I discovered was that, maybe understandably given his background, he was extremely reactive with other dogs. This was something I started working on straight away, and I’m pleased to say that he is much better at agility shows at a distance, though we still have problems if we meet anyone in our local woods. With these problems in mind, about six months after getting Chip, I decided to start agility training with him. That first foundation lesson was terrifying. We train in an outdoor arena which has wooden fencing but is not totally secure. I was convinced he would abscond if I took him off lead. Therefore, I worked him for about 15 minutes on a very light line, and was pleased to get a few minutes of focus out of him in that time. Gradually I began to feel a little better about working him off lead and risked taking the line off. My heart was in my mouth when he ran to the fence a couple of times, but obviously didn’t realise he could escape. By the following February, he was showing a great deal of promise and completing short sequences. I was delighted with his progress. Then the inevitable happened! He ran to the fence and spotted an unsuspecting bunny on the other side. Before I knew it, he was off! Thankfully I managed to catch him after about 15 minutes, but that was the end of my new found confidence. If I was to continue training him, I would have to come up with a solution. The solution came in the form of the orange barrier fencing that many people use as gardens at agility shows. I still arrive up to an hour early at training to tie up this wretched fence all the way around the arena with string. How I hate that orange netting! It took a while to get his focus back on me and away from the bunnies, but with the barrier in place, Chip once again began to make progress. I entered him in a local indoor show which I knew would be quiet. Due to his reactivity, they kindly let me into the arena via a back door, and actually I was very pleased with Chip. Yes, he ran off to sniff in places, which was obviously displacement behaviour, but he also did some very good work, and even ran down a line alongside the fence which had people and dogs behind it without paying them too much attention! He had a quick glance at them whilst doing his 2on/2off on the A-frame, then refocused on me. I was delighted. 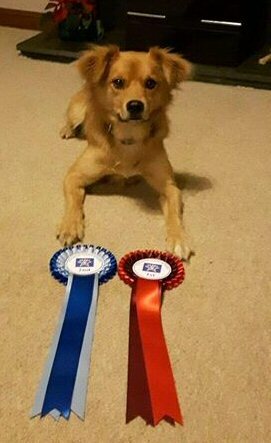 Chip was amazing- both his Agility and Jumping runs were fabulous, earning us a 1st place in Jumping and a 2nd place in Agility. He was focused all the way round the course and completed a 12 pole weave perfectly. I was over the moon! Buoyed up by this success, we entered a UKA show a few weeks later, and I decided to try a competition run again. Disaster! No focus at all. I think that the number of dogs at the the show had just upset him too much. I really should have known better! Almost three years since I got Chip, we now seem to have reached something of an impasse. I really can’t see a time when I will be able to run him outdoors at a Kennel Club show with just a ring rope between him and the wildlife! Still, last summer I tried him in the ring at Riot UKA show where they have fenced rings and very nice fielders… errr helpers, and I did manage to get him to play and focus a little. I let it go to my head a bit again though, and entered him in another class where he ran off to the fence and did his meerkat impression and gave me another heart attack! We are heading back to Riot this year to try again – gotta love a trier! Will I ever get Chip competing at outdoor shows? Who knows, I guess one should never say never. What I do know though is that I love him to bits, really enjoy the challenge of training him, and will continue to do so. Would I recommend anyone else to get a rescue from abroad? Mary McKie lives near Lockerbie in Scotland with her three dogs - Todd, Breeze and Chip. She started agility in 2000 with her sprollie Corrie and then Todd who made it to Grade 5 just before retirement. She is currently working Breeze who has just won into Grade 6. Mary is really hoping that Breeze (9) will manage another year or two, though next year she may be limited due to awaiting two partial knee replacements this coming winter.